March is drawing to a close, May no longer seems so far away, and signs of the Giro d’Italia’s arrival are appearing in the three Veneto stage cites: Bassano del Grappa, Belluno, and Vittorio Veneto. 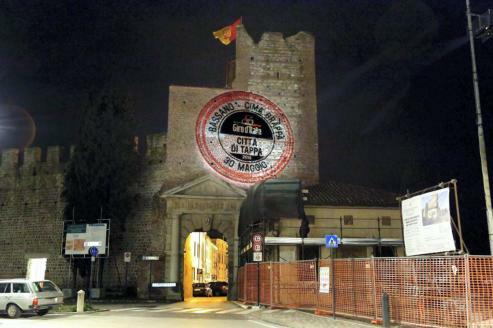 In Bassano, start of the time trial up Monte Grappa, the official stage city logo is projected each night on the walls of the Torre delle Grazie, one of the most characteristic passages into the city, and through which the riders will pass. A host of related events has been planned to celebrate the race, which locals are calling “a stage that will remain in the history of modern cycling.” The week before, entrants in the Mille Miglia vintage auto rally will cross the Ponte degli Alpini; there will be cycling-related photo exhibits, a non-competitive climb and decent of Monte Grappa on closed roads, and a vintage bike ride (both of which I have signed up for, of course!). The antipasto of the stage itself will be the passage of local legend Simone Temperato, aka Magico Tempe, who will cycle the entire climb of Monte Grappa on one wheel! 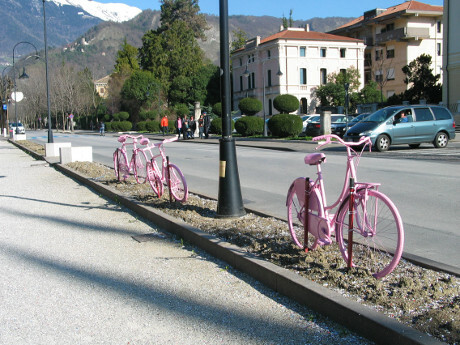 Vittorio Veneto has planned music, sporting, and gastronomic events to celebrate the Giro’s arrival. 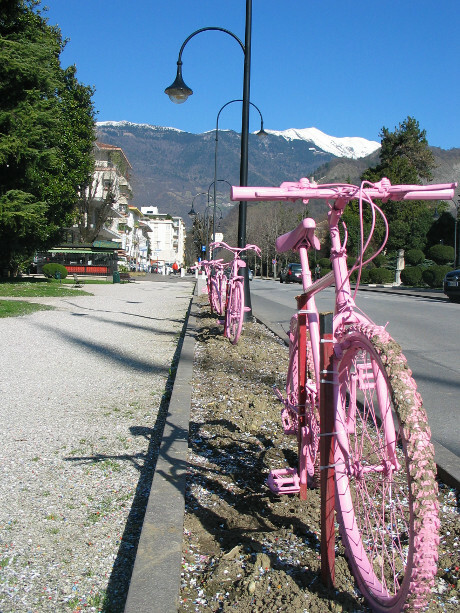 Other initiatives prepared by the the stage committee include a pink fountain, decorated store windows, banners, and the most original and visible: 40 or so pink bikes placed in public gardens, in piazze, on traffic circles, and along city streets. In the following days, requests for even more of the cheerful pink bikes were made by store owners, agencies, and offices throughout the city. Score one for art! I’m green with envy that you’ll soon be living life in the pink. But never mind, at least the SBS tv channel here in far-away Australia is going to broadcast the Giro each day (last two hours or so). Sleep loss for Australians, since we’re 8 hours ahead of Italy. I’m looking forward to the occasional comment from yourself as the Giro passes through the wonderful Veneto.